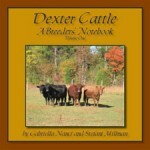 Dexters come in several colors, although they are always solid colored; never spotted. Many have white on their udder. The three basic colors are Black, Dun, and Red. However, animals that are black at birth can sun fade and look quite red, especially their first summer. They will go back to black when their hair sheds out and should not be considered Red or Dun. Dun comes in shades of blond, cocoa brown, strawberry blond, and mahogany. Duns always have a tannish brown nose and brown “eyeliner,” although their eyes are typically lighter in color than the eyes of other Dexters. Red comes in shades from bright carrot red to very deep red. It is usually the darker Duns that cause confusion, since they start to look like the darkest Reds. There are two types of Red: Reds with pink noses, and Reds with black noses. The pink nosed Reds have pink “eyeliner” (which helps to tell them from the duns). 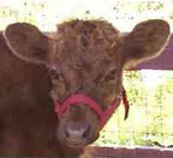 The pink nosed Reds are associated with the “e” genotype, or “true” red and a lighter coat color. 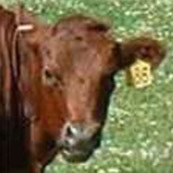 The black nosed Reds are associated with the E+ genotype or “wild-type” red and a darker coat color. However, since other genes are involved with the color of the nose/eyeliner, and the darkness of the coat, there are exceptions, and you cannot be sure of the animal’s red genotype without a test, (which is available at virtually any laboratory doing cattle genetic testing). We now know that the genes responsible for Red and Dun are not located anywhere near each other, and the two colors are genetically quite different. Before the influx of A.I., it seems most non-black animals were Dun. But now, red is becoming increasingly common. Most Red animals in the U.S. descend from handful of popular A.I. bulls: Marnel’s Black Magic, Lucifer of Knotting, Saturn of Knotting, Saltaire Platinum, and Cornahir Outlaw. The gene responsible for Dun coloration in Dexters was discovered in 2002 and has not been found in any other breed. 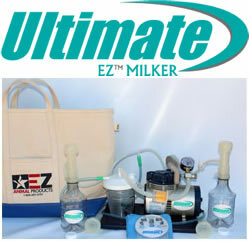 The test is now available at several laboraties; Saskatchewan Research Council/Genserve, Texas A & M, and UC Davis. The link for UC Davis laboratory can be found on our “links” section. This is very informative. Thanks for sharing the information. Very interesting thank you this has helped a lot. We appreciate this info, but we have a question about one of our cows. The sire is red (no dun or black) and the dam is dun, carries red. Their heifer at 8 months was primarily red with black marbled into her coat, but UC Davis test results show she is red carries dun. 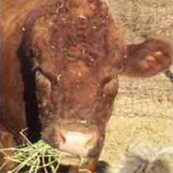 At 1-year of age she is primarily black with red hair from her bangs all the way down her spine. There is some red around her ears. Her nose is black with a pink surround. Face, including around eyes–black. Quite unique! Any thoughts? She is dam and sire verified. Thank you very much! Sounds like she is still red. She must have an E+ allele, and different modifiers are giving her a heavy dose of the black shading that is allowed to show when an animal has an E+ allele. 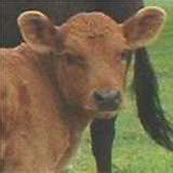 The lighter color around her muzzle and ears is another pattern, yet, called mealy mouth. Those two traits of the super dark shading and mealy mouth are probably not linked genetically, but they tend to be carried in the same bloodline.